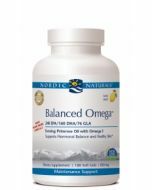 Balanced Omega Combination has an equal balance of omega-3 and omega-6 essential fatty acids‚ both of which may ease the discomfort of hormone fluctuations. Your body doesn’t produce these fatty acids naturally‚ so they have to be obtained either through your diet or dietary supplements. The most potent food source of these fatty acids is certain types of fish; however‚ they may be too expensive‚ inconvenient‚ or just not to your taste. Hormones can make being a woman difficult at times. At various times in your life‚ you may suffer from premenstrual syndrome (PMS) or menopause; these natural conditions can cause hormonal symptoms such as irritability‚ depression‚ mood swings‚ and hot flashes. When you’re finished dealing with one‚ the other is there to take its place. 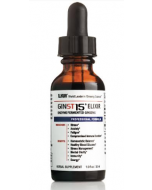 There are over-the-counter and prescription medications you can take to ease your symptoms; you can also use a supplement. 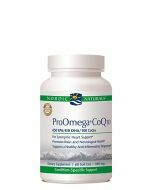 Nordic Naturals’ Balanced Omega Combination may ease your symptoms without side effects. 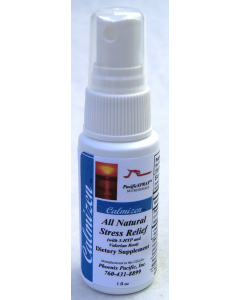 These soft gels have a pleasant lemon flavor‚ and contain a variety of ingredients that may ease hot flashes‚ mood swings‚ night sweats‚ and many of the other symptoms that go along with PMS and menopause. Ingredients: Purified deep sea fish oil (from anchovies and sardines)‚ evening primrose oil‚ soft gel capsule (gelatin‚ glycerin‚ water‚ natural lemon flavor)‚ natural lemon flavor‚ d-alpha tocopherol‚ rosemary extract (a natural preservative). No gluten‚ milk derivatives‚ artificial colors or flavors.